Knottingley is a town within the metropolitan borough of the City of Wakefield in West Yorkshire, England on the River Aire and the old A1 road before it was bypassed as the A1(M). 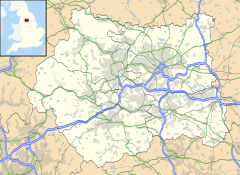 Historically part of the West Riding of Yorkshire, it has a population of 13,503, increasing to 13,710 for the City of Wakefield ward at the 2011 Census. Until 1699, it was an important inland river port but, in that year, the Aire was made navigable as far as Leeds, which soon surpassed it. Knottingley continued as a centre for boat building into the 20th century. In the late 19th century, it started glass manufacturing. The town is served by Knottingley railway station. After 1870, the town became known for glass manufacturing. In 1887 Bagley's Glassworks purchased the rights to the first bottle-making machine, invented by a Ferrybridge postmaster. There is a Bagley's Glass gallery in Pontefract Museum. Close to Knottingley is the Ferrybridge Power Station, which has the largest cooling towers of their kind in Europe. Three of these towers collapsed in high winds in 1965. These towers can be seen for miles around. One of the oldest purpose-built cinemas in England, located in Aire Street, has been converted into flats. The town was the last in the United Kingdom to have a working deep coal mine, Kellingley Colliery, until it closed in December 2015. Knottingley means "the clearing of Cnotta's people", from the Old English personal name Cnotta meaning "knot", describing a small, round man and -ingas "people of" + leāh "wood, modern lee, not the same meaning as Leah (personal name)". The name was recorded as Cnotinesleahemm in 1128. Knottingley, inextricably linked with Ferrybridge, is a West Yorkshire town whose history is tied to river travel and industry. It has managed to retain certain elements of that industrial history as thriving enterprises today, providing employment for many of its combined population of some 17,000. It was originally an Anglo-Saxon settlement, though the ancient monument of Ferrybridge Henge shows it had significant indigenous habitation long before then. The crossing over the Aire at Ferrybridge was of importance for many centuries. A bridge was built there in 1198, and another to replace it two centuries later. Located on the Great North Road linking London with York and Edinburgh beyond that, the town became an important staging place for the coach traffic on that route. The traffic continued to develop, until in 1804 the government had to build a wider bridge over the river to accommodate it. The new bridge was designed higher to allow easier passage of the barge traffic on the Aire and Calder Navigation. Knottingley was an inland port of some note, long the last navigable point on the Aire until the Aire and Calder Navigation, built in 1704 and widened in 1826, enabled barges to make it to Leeds. Its shipyards built and maintained both inland and seagoing vessels. Pottery was a significant industry for the town from the 19th century until as late as the 1940s, when the Australian Pottery, opened to cater to that country's needs, finally closed. Glass manufacturing continues to be important. The town had Kellingley colliery operating until December 2015. The demand for coal was helped by the huge power station at Ferrybridge. Whilst most of the coal bound for Ferrybridge left by rail, some was transported up river using barges, the last of which was delivered in December 2002. Knottingley is a central point for horse racing fans, with tracks at Pontefract, York, Wetherby and Doncaster all close by. It has several primary schools: England Lane Academy, Willow Green Academy, Knottingley St Botolph's C of E Academy, The Vale Primary Academy and Simpson's Lane Academy. Sixth-form colleges are located in nearby Pontefract, Wakefield and Selby. Wikimedia Commons has media related to Knottingley. ^ "Census 2001 : Urban Areas : Table KS01 : Usual Resident Population". Office for National Statistics. Archived from the original on 23 July 2004. Retrieved 26 August 2009. ^ "City of Wakefield Ward population 2011". Neighbourhood Statistics. Office for National Statistics. Retrieved 2 March 2016. ^ Ekwall, Eilert (1960). The concise Oxford dictionary of English place-names (4. ed.). Oxford: Clarendon Press. p. 282. ISBN 0-19-869103-3. ^ "Early History Official guide to Knottingley". www.knottingley.org. Retrieved 17 March 2017. ^ Hadfield, Charles (1972). The canals of Yorkshire and North East England (1 ed.). Newton Abbot: Vt. pp. 17–20. ISBN 9780715357194. ^ "15.0 Archaeology and cultural heritage" (PDF). peelenvironmental.co.uk. pp. 363–364. Retrieved 17 March 2017. ^ "Knottingley & Ferrybridge delivery plan 2012-2015" (PDF). wakefield.gov.uk. p. 21. Retrieved 17 March 2017. ^ "The History and Origins of Knottingley and Ferrybridge". www.knottingley.org. Retrieved 17 March 2017. ^ Bounds, Tom (11 December 2015). "Date set for closure of UK's last deep mine at Kellingley". FT. Retrieved 17 March 2017. ^ Ledger, John (31 March 2016). "Closure of Ferrybridge fuels sense of missed opportunities". Pontefract and Castleford Express. Retrieved 17 March 2017.